Tired of chainsaws, jump-scares, and phony fog? Looking for a more sophisticated way to enjoy Halloween in Los Angeles? 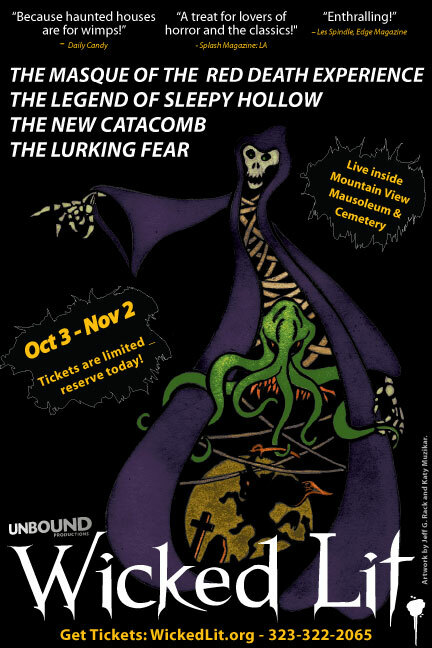 Then you must - absolutely must - head over to the Mountain View Mausoleum in Altadena for the 2013 Wicked Lit Halloween Theatre Festival. Rather like the Headless Horseman galloping through Sleepy Hollow, Unbound Productions has truly hit its stride this season, crafting its finest production to date. 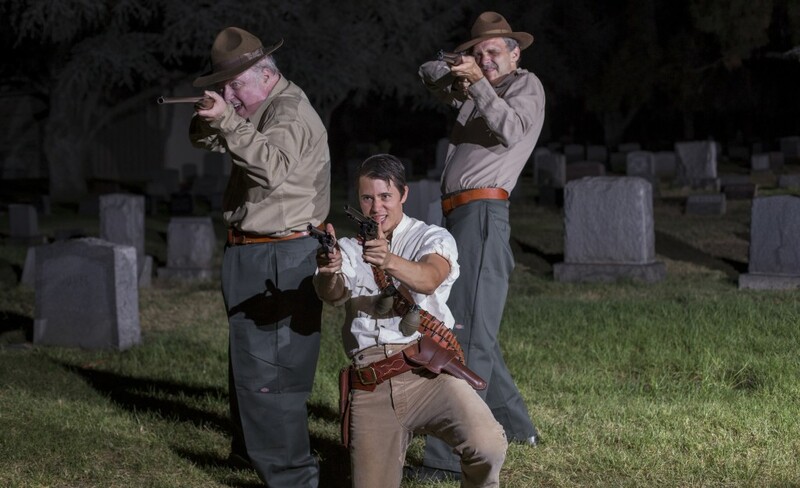 The essential strategy remains - a trio of one-act plays based on classic horror literature, staged in a real location - but Wicked Lit navigates the terrain like never before, taking you on a tour of imaginary landscapes that come to life with alarming authenticity. What makes this Halloween different? Two elements. First, the plays have been more carefully staged to exploit the mausoleum and cemetery locations, with scenic transitions incorporated into the story. In seasons past, a scene would unfold in one area of the grounds; then a story guide would lead the audience to the next location, chatting on the way; another scene would take place, and so on. This Halloween, the action continues as the audience moves from one location to the next, often at a lively clip, with the cast of characters either pursuing or being pursued through tombs, gravestones, and catacombs. The story guides tend to be more fully incorporated into the dramas as supporting characters or more insistent about keeping you on the right path, enhancing the illusion of being swept up into a living narrative taking place around you. Second, the "Masque of the Red Death Experience" perfects an approach attempted last Halloween, filling the lulls between the plays with interstitial vignettes, songs, poetry readings, and improvised interactivity - thus creating a more unified experience out of the anthology format, one that engulfs you almost from the moment you set food on the grounds, until you leave at the final tolling of the midnight hour (figuratively speaking, that is). Not, strictly speaking, a play in and of itself, the Masque of the Read Death Experience takes the setting rather than the narrative of Poe's story and uses it to synthesize the evening's fragmented entertainment into a satisfying whole. The audience is treated like the invited guests of Prince Prospero, safely ensconced within the walls of his castle, enjoying revelries and entertainment while the lethal Red Death ravages the countryside without. Masked dancers, singers, musicians, and jugglers greet you as you enter, then endeavor to please you with their proffered entertainments, which range from the bawdy to the sophisticated. The highlight is a series of songs - duets for voice and cello - that incorporate such cherished works from the Poe canon as "Annabelle Lee" and "The Raven" (the latter illustrated by an eccentric interpretive dance). The lyrics amend Poe's poetry to fit the music, and the time signatures subvert the original rhythms, but the re-purposing is precisely attuned to the musical format, and the actual melodies (beautifully sung) are startling in their ability to enhance Poe's words. In particular, "The Bells" is quite literally capable of bringing tears to your eyes. Remarkably, the compositions generally avoid obvious minor-key moodiness and yet still manage to capture the tortured anguish of the text. So when is the soundtrack album coming out? Based on the story by H.P. Lovecraft, this adaptation exemplifies many of the strengths of this year's Wicked Lit. Too often, past plays have fallen into a predictable format, beginning with a dialogue between two characters, who stand around talking not because they need to say anything to each other but because they need to fill the audience in on the back story. "The Lurking Fear," by contrast, begins in media res: after the audience is almost stampeded into a chapel to avoid strange cultists barring any avenue of escape, we meet characters (sheriffs, bounty hunters, a reporter), who are also seeking shelter from the threat outside - which includes not only the cult but also a monster. After the wary adversaries join forces and set off on their quest - only then, is the exposition neatly parceled out. As we follow the band outside and eventually into an old mansion, the sense of being on the run - alternately pursuing and pursued - is palpable, giving this play an energetic adrenalin kick unlike its companion pieces. The action maintains a fever pitch, matched by the characters, particularly the junior bounty hunter (Eric Keitel) - a wild-eyed loon who is nonetheless rather likable. The drama borrows only a few basic ideas from the titular tale (such as a tell-tale genetic quirk - two eyes of different color - that reveals the monster to be a descendant of a human family that devolved back into savagery), and combines them with other pieces of the Lovecraft mythos (Cthulhu makes an appearance to the characters if not to us). Unlike many Wicked Lit plays, which tend to be more suspenseful than outright horrifying, "The Lurking Fear" does indeed generate a few shivers, especially when the cultist emerge from the shadows, surrounding the audience outside or lurking within the mausoleum walls. Unfortunately, the climax requires a rather hefty information dump that undermines the impact of the melodrama. Things were not quite as they seemed, we are told. Unlike a really good twist, however, this one does not make the pieces of the puzzle suddenly fit in a new way but instead jumbles up for the sake of a surprise. Too bad: the ending could have had a profound impact if the groundwork had been laid on a more solid foundation. Unlike "The Lurking Fear," this play, based on a story by Sir Arthur Conan Doyle, does indeed resort to the traditional opening ploy of having two characters stand around and talk. Fortunately, there is some inherent mystery in the situation, as one of the characters has come all the way to Rome to see a new catacomb recently discovered by an old acquaintance. The unfamiliar setting (unfamiliar to one of the characters, at least) and the lateness of the hour create a sense of wary expectation, and the dialogue that follows really is needed for each character to bring the other up to speed. Unfortunately, the scene plays a gambit that does not pay off. Attempting to sound like men carefully weighing their words before divulging sensitive secrets, the two performers (Chairman Barnes and Carlos Larkin) sometimes sound simply like actors straining to remember their lines. The measured delivery dissipates much of the ominous atmosphere - until the pair set off to visit the new catacomb. Then things get creepy - and very dark. What follows reads like Doyle's attempt to retell "The Cask of Amontillado" (a fact tacitly admitted when the villain of the piece queries his unwary adversary, "Ever read Poe?"). The difference here is that the temptation is not a cask of wine but a great archeological discovery, and there is an additional twist or two that will surprise you even if you are familiar with Poe's tale. The mausoleum corridors are put to excellent use here. The long halls, barely lit, suggest a subterranean labyrinth in which it is easy to imagine being lost. Like the hapless victim, we are instructed to hold onto a string that traces the correct path; the fragile thread serves only to remind us how tenuous are grip is on the means to find our way back. The finale plunges us into near-total blackness, enhanced by echoing voices that obscure the location of the characters. The sense of hopeless dread - fear of the dark, of being lost and helpless - is quite pronounced. Then just when you think it's over and your story guide is leading you to the exit, you pause for one last little exclamation point. With its use of space, sound, and lighting (or lack thereof), "The New Catacomb" takes Doyle's literary idea off the page and brings its climax to life so well that it is hard to imagine a more effective rendition. 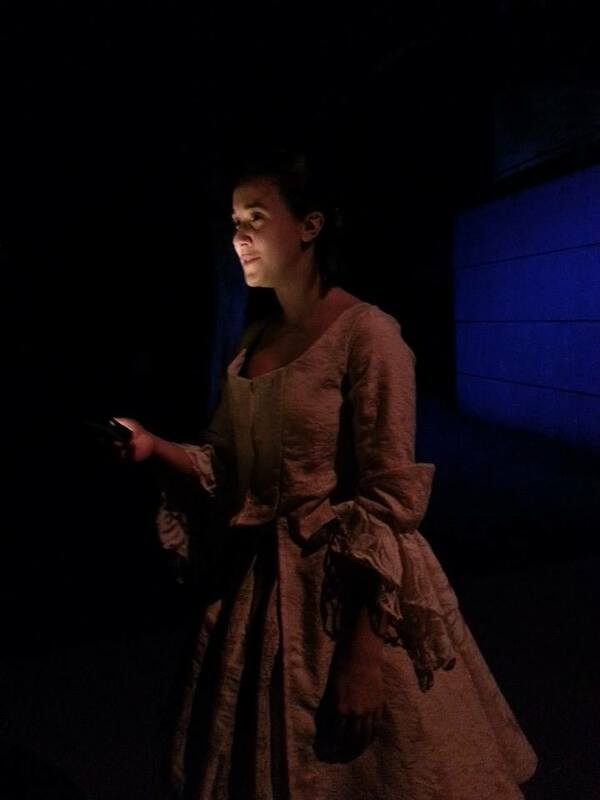 An innovative touch: actress Ilona Kulinska (as Katrina Van Tassel) provides her own illumination in a scene from "The Legend of Sleepy Hollow." Washington Irving's classic tale (subject of a Disney cartoon, a Tim Burton film, and a new television series) is suitably spooky for the Halloween season, but its most familiar image - The Headless Horseman - would seem difficult if not impossible to achieve in a live, outdoor staging. Unbound Productions pulls it off, however. This adaptation feels a bit like a live reading of the story, with various bits of narration parceled out to actors who also perform roles within the drama. What might have been static within a conventional stage venue comes to vivid life on the mausoleum grounds. The blocking of the action is so elaborate that it virtually qualifies as dance choreography, with characters making rapid entrances and exists, replacing each other in different areas, appearing first before you, then above you, then behind you. The story, rendered more faithfully than in the 1999 film with Johnny Depp, has a certain amount of humor thanks to the figure of Ichabod Crane (a schoolmaster, played by Eric DeLoretta, who woos a woman more for her larder than her charms). Nevertheless, "The Legend of Sleepy Hollow" delivers the Halloween chills when Crane departs from a party and rides home through territory allegedly haunted by the ghost of a Hessian Horseman who was decapitated during the Revolutionary War. The cemetery setting for the final confrontation is perfect, and the personification of the Headless Horseman is an impressive technical feat: at first suggested by sound effects, the Horseman eventually appears as an imposing figure silhouetted in the distance, then as a rider on a spectral horse (a glowing special effect projection), before finally hurling a Jack-O'Lantern head at the unfortunate Crane, who is last seen haplessly wandering among the gravestones himself, like a lost and blasted soul. This was our favorite of this year's trio of plays. It is ironic that this adaptation of "The Legend of Sleepy Hollow" dates from a few years back (when it was performed at Wicked Lit's previous location), because this presentation of it seems to be the perfect culmination of what Unbound Productions has been building toward over the course of the past two Halloween seasons. The multiple, moving narrators convey the story directly to the audience, without contrived dialogue; the constant scene changes keep the action flowing without forcing an unnatural pace; and staging utilizes the available locations, so well that we almost feels as if we were walking alongside Ichabod through Sleepy Hollow. Also, we were pleased to find Wicked Lit upping the immersive quality of the event by "casting " the audience as guests at a party, where Ichabod's rival, Brom Bones (Shawn Savage), regales the assembled folks with tales of his own encounters with the Headless Horseman). Despite the slightly shaky start of "The New Catacomb" and the muffled ending of "The Lurking Fear," this year's trilogy of terror strikes a remarkably satisfying balance of settings and stories, and "The Legend of Sleepy Hollow" struck as Wicked Lit's most perfectly realized production to date. In the past, one daunting challenge of Wicked Lit was to create a satisfying send-off. Whatever the strengths of the individual plays, they cannot build to a climax, because there is no telling in what order they will be viewed (the audience is divided into three groups, each experiencing the stories in a different sequence). Consequently, the conclusion of the third play - whichever one that happened to be - often felt open-ended, as if something more should happen. For Halloween 2013, the "Masque of the Red Death Experience" provides that closure, with the climactic appearance of the Red Death himself - a giant, spastic stilt-walker who arrives at the stroke of midnight, accompanied by a reading from Poe's lament for mortality, "The Conqueror Worm." As the last of Prince Prospero's revelers falls before the crimson embodiment of the plague, there is no doubt that each member of the audience will feel he has supped his full allotment - "much of madness, more of sin, and horror..."
Since 2010, the Wicked Lit Halloween Theatre Festival has been an interesting change of pace from more traditional Halloween haunted houses and hayrides. This year, it becomes a must-see event. We cannot recommend it highly enough. 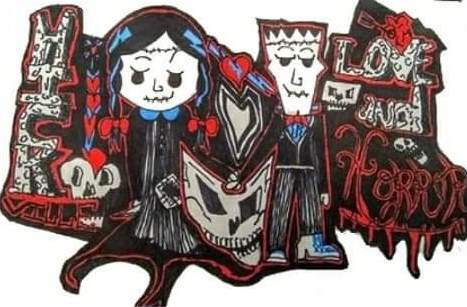 Find more Halloween Shows and Tours on this page. 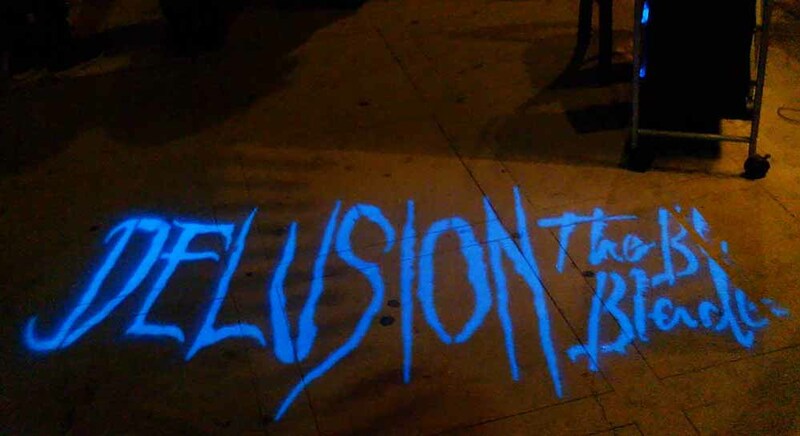 Or click here for our master list of Halloween Haunts in Los Angeles.